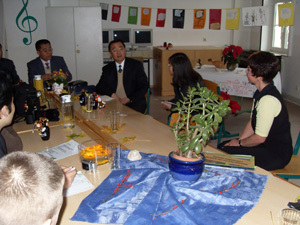 An official delegation from Sichuan Government in China visited the “Schule zur Lernfoerderung” Engelsdorf / Leipzig on the 15th November 2011. The five participants got informed on energy education in this school and on the EGS approach. In France, the local forums were organised by AREHN to discuss about energy saving and energy efficiency in school with different stakeholders. It aims at strengthen the capacities of the schools and their role in policy making, making their capabilities available for the local communities and involving stakeholders in and around the schools. The goal is to actively develop ideas to increase energy efficiency at the local community level related to the schools. The forum took place in the high school Les Fontenelles in Louviers. Imagine the fuel saving potential by "simply" thinking when driving! Styrian (AT) schools of agriculture and forestry piloted an approach to raise awareness about clever driving. The Styrian clever driving competition was developed within the Intelligent Energy Europe Project EGS, which intends to raise awareness about energy efficiency and saving in European schools and use schools unique position to act as multipliers in energy saving and intelligent use of energy.